Glass for pencils with a list. Preparation is turned from deciduous breeds of a tree. Height of 14 cm. The decorative list manually is applied on a surface. The product is varnished. Quality of production is confirmed with the certificate of the State sanitary examination. Souvenir keg with a decorative list of handwork. Preparation is turned from deciduous breeds of a tree. Height of 17 cm. The product is varnished. Quality of production is confirmed with the certificate of the State sanitary examination. Souvenir brelochka in the form of dolls. Preparation is turned from deciduous breeds of a tree. Products are painted manually in style of national traditions and varnished. Quality of production is confirmed with the certificate of the State sanitary examination. 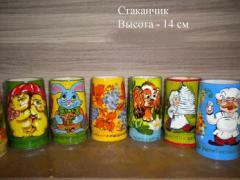 Unbelievable price on Gifts & Souvenirs in Chernigov (Ukraine) company Fabrika Hudozhestvennye promysly, OOO. Wide choice of quality products at affordable prices.